During the day, I professionally work on a web application called Pearson Access. Today we determined that we needed a user administration process for one of our Pearson Access customers that would require them to always select a certain user role when creating a new user. The system doesn’t auto-check the role, the user will need to be trained to check it. But, being a geek, that got me thinking. What if Greasemonkey could be used with a Greasemonkey script in Firefox to automatically check a role when creating a new user account. So, I wrote such a script: autoselectrole.user.js. I have created my first Google Gadget, Goal Chart, back in November 17, 2006. It is a simple gadget that shows one horizontal bar chart. In the preferences, you can edit the goal name, goal value, and current value. It is intended to be a “Savings Goal” chart, where you can specify a monetary value and track your current progress toward the goal. The goal value and current value should be decimal numbers. Once the user preferences are saved, the goal progress is displayed in the bar chart as a percentage. I have had the Goal Chart installed since November 17, 2006 on my Google Personalized Homepage. I use it to track my progress towards paying off my second mortgage. It provides “visual motivation” by showing a bar chart of my progress towards paying off the loan. Once the gadget is installed in Google Personal Homepage, you need to edit the preferences. The field “Name” is used in the title of the gadget. The field “Goal” is a decimal number that represents what you want to reach. The field “Current” is a decimal number that represents where you are currently at. This shows my load amount of $22,869.00. I have currently paid back $12,168.43 of the principal. This means that I have paid back 53.21% of the loan. 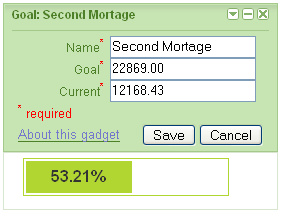 Each month when I send in my loan payment check, I update the Goal Chart preferences, changing the “Current” field. This updates the percentage calculation and bar chart.